2 January. The last piece of cake. So far I am doing well with the planning-ahead. It’s only been one day and I had the day off. I am laughing at myself. I went for a nice run today and went food-shopping. I made a list of what is available in the fridge to grab on the way to work. I made tomorrow night’s dinner (unless the hoards eat it for lunch, in which case there are standing orders to plan dinner again). I partially cooked some veggies and made a garlic mushroom tomato thing for a side dish. I boiled enough eggs for an ice age. I had a last piece of the yule log with coffee & milk, but remained wheat free. 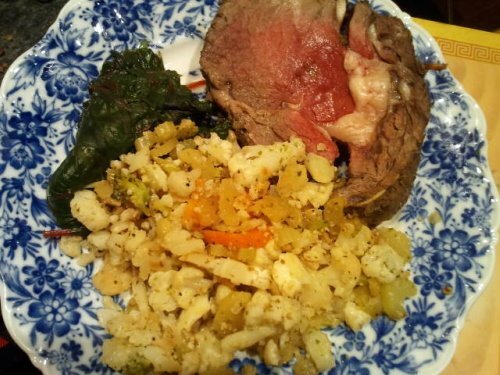 roast beef, cauliflower, chard. tasty & satisfying even without Yorkshire pudding and gravy. Along with decluttering my body, I’m also “blessing” my home. Sorted a couple pair of in-line skates that have been outgrown and tossed four old bike helmets that were caked with dog hair and dust. Don’t ask. I won’t tell. And bagged outgrown kids clothes. I wonder if I stop feeding them so well if their clothes would fit longer. Nah. They’d probably start sneaking food. Posted in Uncategorized and tagged january. Bookmark the permalink.